An official says gunmen attacked a commercial farm in Ethiopia's western Gambella region and killed five workers.Government spokesman Shimeles Kemal said Sunday that the attackers wounded nine people as they shot indiscriminately late Saturday at workers on the vast farm. The property is owned by Mohammed Al-Amoudi, an Ethiopian-born Saudi businessman who is among the world's richest men. He said that among the dead were four Ethiopians and a Pakistani national. Five Pakistanis were among the wounded. The official said six of the suspected assailants are now in police custody and that it is still unclear why the farm was targeted. 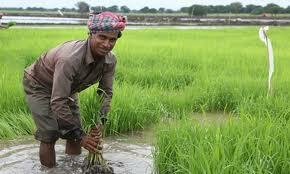 The farm produces cash crops such as rice.